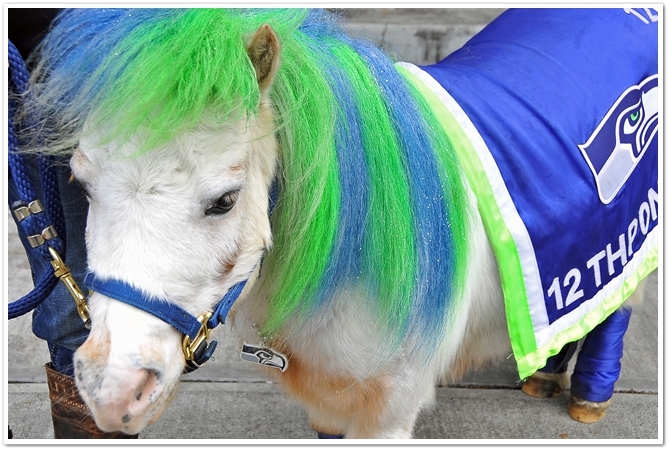 Wilson The Pony is one amazing, and very special little pony..... He is also the one and only, official 12th Pony! Wilson attends every Seahawks home game, he also participates in all Seahawks fan rallies, events, parades, Blue Friday celebrations and tailgate parties! He is friends with the rich and famous, and gets invited to some of the coolest parties in town, and loves being the VIP (Very Important Pony) everywhere he goes! In addition to being the 12th pony, he is also a professionally trained and licensed therapy pony. When he isn't out supporting his favorite football team, he is touching lives by visiting children, adults and seniors in hospitals, assisted living centers and out in our community. He frequently makes appearances at charity events and fundraisers for multiple causes including terminally and chronically ill children, Autism, Cancer, Alzheimer's Disease, Domestic Violence, Child Abuse, Homelessness, and support for our military, their families and veterans with PTSD. 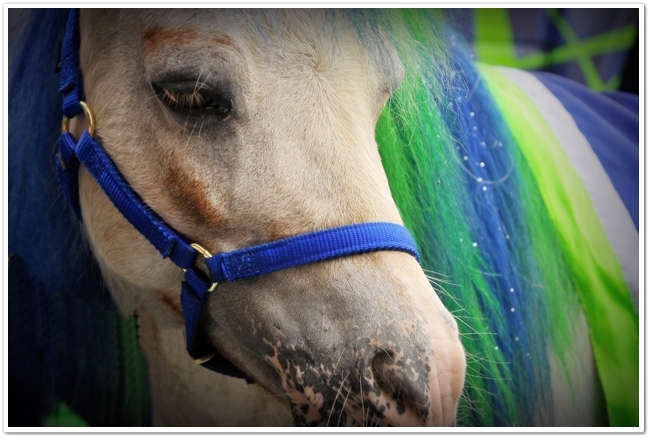 Wilson is a brave, patient and kind pony with a gentle spirit, that adores attention. He has a huge heart, and a very forgiving soul. Wilson was rescued only 6 years ago from a very sad and horrifically abusive living situation. He was slowly rehabbed, loved and given time to gain trust. He shows great appreciation for a second chance at life, and he is now a hero pony that transformed from a terrified rescue pony, into a brave, trusting and loving therapy and celebrity wonder pony. He is a total inspiration to the lives he touches and brightens every day. Wilson has received years of professional training (the same kind of training used for mounted police horses). This is what makes it possible for him to be out in public, and keep both the public and himself completely safe, in any environment. Things that would terrify most equines, don't bother Wilson. He doesn't mind loud noises, crowds with thousands of people, cars, balloons, music or even helicopters landing next to him! He rides in elevators, can climb up and down stairs, likes being on stage, on dance floors and even loves fine dining in restaurants! Wilson has a naturally sweet and quiet attitude, with a big kind heart. He loves making people smile, and feel better, which is what makes him such a great therapy pony.... But he also has a "Diva" side to him! He loves getting attention, posing for selfies and being admired by thousands of people! He thoroughly enjoys attention, being in the limelight and having all eyes on him!